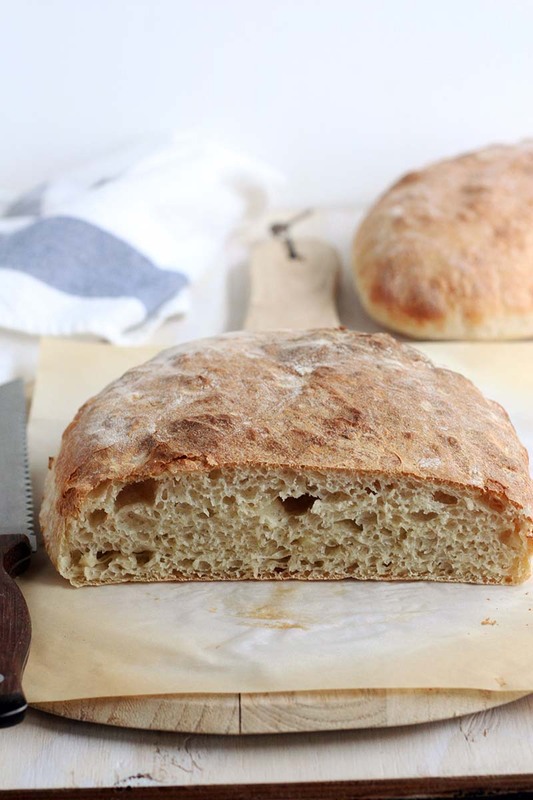 Classic ciabatta bread with a garlic twist. Perfect for sandwiches or mopping up sauces and soup. Dissolve the yeast in the water. Add the bread flour and stir to make a wet dough. Cover with plastic wrap and let sit at room temperature for at least 8 hours and up to 15 hours. The next day the starter should be soupy with a bubbly surface. Preheat oven to 350°F. Wrap the garlic in foil and bake for about 30 minutes until fragrant. Let cool, then slip garlic cloves out of their skins and roughly chop. In the bowl of a stand mixer fitted with a dough hook, dissolve the yeast in the water. Add all of the starter and use a dough whisk or spatula to break it up into the water. It doesn't have to completely dissolve into the water. Add the bread flour, salt, sugar, and chopped garlic. Knead the dough with the mixer on medium speed for about 12-15 minutes. At first the dough will be very wet, but eventually it will thicken and clear the sides of the bowl, and turn glossy and smooth. Cover the bowl with plastic wrap and let rise in a warm place until tripled, about 1½ hours. With generously floured hands, scoop the dough out of the bowl onto a floured surface. Divide the dough in two. Working very gently, and re-flouring your hands as necessary, shape dough into oblong loaves and place each on a sheet pan lined with parchment paper. Let rise, uncovered, until doubled, about 45 minutes. Meanwhile, preheat oven to 475°F. Bake until golden brown and sounds hollow when tapped, 20-25 minutes. Let cool slightly and serve warm or at room temperature. Store in an airtight container at room temperature for up to 3 days. Recipe created by Completely Delicious.